In this fast growing of the internet and technology, the mobile phone plays an important role in the online business. The invention of the mobile application is the trending platform in the current world. So Phpscriptsmall developed B2B Marketplace Android App to help an entrepreneur to start own b2b trading marketplace platform for the benefits of business person around the world. Our Business to business android application is the best android app that helps to connect the supplier, buyers, importer, through all over the world and it connects all the peoples in the one platform that helps to develop the business in the online. The customer can access the b2b android application anytime from anywhere. The buyers, suppliers, and admin can easily get benefit from this business to business application. Phpscriptsmall b2b android app is designed with unique features, functionality and user-friendly to use. The user can login with the valid username and password. In the home page, there is the navigation icon which contains home, my ratings, profile and logout. After that, the user can see the home page with the list of featured and new selling products with the product name, image, description, and ratings. By clicking the specific products the user can see the entire product details. The buyers can browse the products with the product categories wise and keywords. If the buyers need any information about the product, they can send inquiry about the product by clicking send inquiry button. So the buyer’s can easily request the quote for the products from the seller. So the sellers can easily get the leads from our business to business android application. The buyer can view the ratings and reviews the product in our app and can able to give ratings of the products. The sellers can add the unlimited number of products in our app with the respective category with the detailed information like product name, image, title, description, features and more on. Using our business to business android application, the owner can fulfill all the business needs. 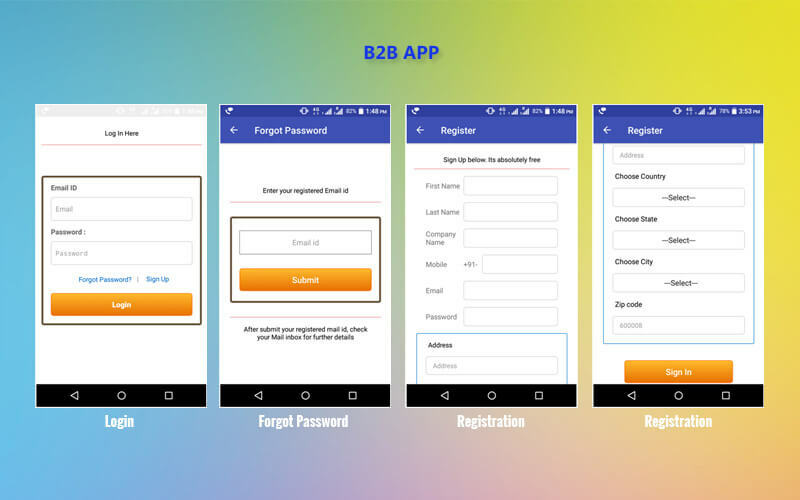 The major features of the B2B Android Application are instant inquiry, view ratings, secure login process, product list, request for quote, profile management, attractive user interface, powerful code, category management, rating & reviews, and many more. With the use of our B2B Marketplace App for Android you can get the latest business updates from worldwide buyers, suppliers, manufactures, wholesales and business leads from the various country. We are the right place to deliver the best B2B Marketplace Android App for the clients at the affordable price with the best quality. I bought this B2B Android Application for my business. It is very useful to contact my clients. On time help from the support team when I need it. Hi, I like this application which is now the trend in the market makes me earn high by using it. Thank You, guys. Hi, I like this application which is now trend in the market makes me to earn high by using it. Thank You guys. This android application is flexible for my online business through mobile. Impressive design and interactive interface. A class app which I saw on the market ever.